Facebook has recently introduced a new feature that lets you use short videos for you profile picture, giving you the ability to enliven your profile page when people visit. Mercifully the short video clips will only play when people visit your profile – so newsfeeds won't get clogged up with animated images. The moving profile pictures can also be used temporarily, so you could use them to show you blowing out candles on a cake on your birthday, or cheering on your team during sporting events. 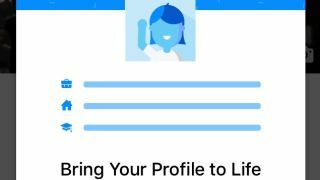 Creating an animated Facebook profile is pretty straightforward – however at the moment only people using the Facebook app on Apple devices can make use of the feature. It's also currently only available in California and the UK at the moment, though hopefully that will change soon. On your iPhone open up the Facebook app and view your profile page. You can do this by tapping on the More icon on the bottom-right hand corner of the screen and then tapping your name. You can also open your profile by tapping on your current profile picture next to where it says "What's on your mind?". On the mobile app you profile picture is displayed prominently in the upper middle of the screen. On the bottom right-hand corner of your current profile picture an icon will switch between a camera and video camera. Tap this icon and select "Take a New Profile Video" to film and upload the video. On the next screen press the big red button to begin recording. A three second countdown will appear giving you time to prepare before the photo is taken. Your iPhone will then record 7 seconds of video – so you'll need to get creative to make an entertaining short video! Once you've recorded the video clip you will get a preview video the loops, letting you see how it will look when people visit your page. If you're happy with the video tap Next and then select the thumbnail you want to show. This image will be shown as your profile photo when the video doesn't play – such as on people's News Feeds. When you're happy with the result, tap save, and your short video will be uploaded as your profile picture. Your profile picture is now a moving image and will play whenever someone visits your profile page either through the Facebook iOS app, or via the website. Visitors using the Android app won't be able to see it just yet – but a note on the app says the feature is coming soon.